The Blue Ridge Mountains are a physiographic province of the larger Appalachian Mountains range. This province consists of northern and southern physiographic regions, which divide near the Roanoke River gap. The mountain range is located in the eastern United States, starting at its southernmost portion in Georgia, then ending northward in Pennsylvania. To the west of the Blue Ridge, between it and the bulk of the Appalachians, lies the Great Appalachian Valley, bordered on the west by the Ridge and Valley province of the Appalachian range. The Blue Ridge Mountains are noted for their bluish color when seen from a distance. Trees put the "blue" in Blue Ridge, from the isoprene released into the atmosphere, thereby contributing to the characteristic haze on the mountains and their distinctive color. 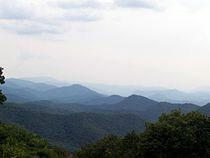 Within the Blue Ridge province are two major national parks: the Shenandoah National Park in the northern section and the Great Smoky Mountains National Park in the southern section. The Blue Ridge also contains the Blue Ridge Parkway, a 469-mile (755 km) long scenic highway that connects the two parks and is located along the ridge crestlines with the Appalachian Trail. Although the term "Blue Ridge" is sometimes applied exclusively to the eastern edge or front range of the Appalachian Mountains, the geological definition of the Blue Ridge province extends westward to the Ridge and Valley area, encompassing the Great Smoky Mountains, the Great Balsams, the Roans, the Brushy Mountains (a "spur" of the Blue Ridge) and other mountain ranges. The Blue Ridge extends as far north into Pennsylvania as South Mountain. While South Mountain dwindles to mere hills between Gettysburg and Harrisburg, the band of ancient rocks that forms the core of the Blue Ridge continues northeast through the New Jersey and Hudson River highlands, eventually reaching The Berkshires of Massachusetts and the Green Mountains of Vermont. The Blue Ridge contains the highest mountains in eastern North America south of Baffin Island. About 125 peaks exceed 5,000 feet (1,500 m) in elevation. The highest peak in the Blue Ridge (and in the entire Appalachian chain) is Mt. Mitchell in North Carolina at 6,684 feet (2,037 m). There are 39 peaks in North Carolina and Tennessee higher than 6,000 feet (1,800 m); by comparison, only New Hampshire's Mt. Washington rises above 6,000 feet (1,800 m) in the northern portion of the Appalachian chain. The Blue Ridge Parkway runs 469 miles (755 km) along crests of the Southern Appalachians and links two national parks: Shenandoah and Great Smoky Mountains. In many places along the parkway, there are metamorphic rocks (gneiss) with folded bands of light-and dark-colored minerals, which sometimes look like the folds and swirls in a marble cake. Most of the rocks that form the Blue Ridge Mountains are ancient granitic charnockites, metamorphosed volcanic formations, and sedimentary limestones. Recent studies completed by Richard Tollo, a professor and geologist at George Washington University, provide greater insight into the petrologic and geochronologic history of the Blue Ridge basement suites. Modern studies have found that the basement geology of the Blue Ridge is made of compositionally unique gneisses and granitoids, including orthopyroxene-bearing charnockites. Analysis of zircon minerals in the granites completed by John Aleinikoff at the U.S. Geological Survey has provided more detailed emplacement ages. Many of the features found in the Blue Ridge and documented by Tollo and others have confirmed that the rocks exhibit many similar features in other North American Grenville-age terranes. The lack of a calc-alkaline affinity and zircon ages less than 1,200 Ma suggest that the Blue Ridge is distinct from the Adirondacks, Green Mountains, and possibly the New York-New Jersey Highlands. The petrologic and geochronologic data suggest that the Blue Ridge basement is a composite orogenic crust that was emplaced during several episodes from a crustal magma source. Field relationships further illustrate that rocks emplaced prior to 1,078-1,064 Ma preserve deformational features. Those emplaced post-1,064 Ma generally have a massive texture and missed the main episode of Mesoproterozoic compression. The Blue Ridge Mountains began forming during the Silurian Period over 400 million years ago. Approximately 320 mya, North America and Europe collided, pushing the Blue Ridges up higher. The English who settled colonial Virginia in the early 17th century recorded that the native Powhatan name for the Blue Ridge was Quirank. At the foot of the Blue Ridge, various tribes including the Sioux Manahoacs, the Iroquois, and the Shawnee hunted and fished. A German physician-explorer, John Lederer, first reached the crest of the Blue Ridge in 1669 and again the following year; he also recorded the Virginia Siouan name for the Blue Ridge (Ahkonshuck). As more settlers moved into Virginia, their economic and at times martial competition pushed the native inhabitants west. The forest environment provides natural habitat for many plants, trees and animals. The Blue Ridge Mountains have stunted oak and oak-hickory forests and comprise most of the Appalachian slope forests. Flora also includes grass, shrubs, hemlock and mixed-oak pine forests. While the Blue Ridge includes the highest summits in the eastern United States, the climate is nevertheless too warm to support an alpine zone, and thus the range lacks the tree line found at lower elevations in the northern half of the Appalachian range. The highest parts of the Blue Ridge are generally coated in a dense spruce-fir stand. The song "Battle Born" by The Killers contains the line "From the Blue Ridge to the Black Hills". The bluegrass song "Blue Ridge Cabin Home" performed and recorded by many, including Flatt and Scruggs. John Fogerty's first solo album, released in 1973, is called The Blue Ridge Rangers, and also contains a cover of "Blue Ridge Mountains Blues". The song "Stonewall Jackson's Way"
The song "Blue Ridge Mountain Sky" by The Marshall Tucker Band. The song "Blue Ridge" by Annuals. The song "Blue Ridge Mountain Blues" by Earl Scruggs. The symphonic band pieces "Blue Ridge Saga" by James Swearingen and "Blue Ridge Impressions" by Brian Balmages. Song and album "My Blue Ridge Mountain Boy" by Dolly Parton. 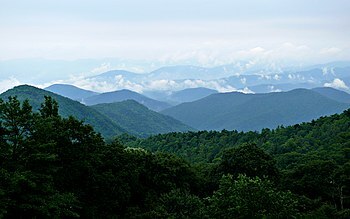 Country-folk singer Townes van Zandt sang "My home is in the Blue Ridge Mountains" in the song "Blue Ridge Mountains". The song "The Trail of the Lonesome Pine". The song "Blue Ridge Mountains" by Fleet Foxes. The song "Take Me Home, Country Roads" by John Denver. The song "Levi" from Old Crow Medicine Show's fourth album Carry Me Back, about First Lt. Leevi Barnard, opens with the lines "Born up on the Blue Ridge/At the Caroline line/Baptized on the banks of the New River." Old Crow Medicine Show also mentioned their "Blue Ridge Mountain home" in the lyrics of their song Half Mile Down which appeared their 8th studio album released in 2012 Carry Me Back. ^ "Blue Ridge Parkway, Frequently Asked Questions". National Park Service. 2007. http://www.nps.gov/blri/faqs.htm. Retrieved 2007-12-29. ^ Leighty, Dr. Robert D. (2001). "Blue Ridge Physiographic Province". Contract Report. Defense Advanced Research Projects Agency (DOD) Information Sciences Office. http://www.tec.army.mil/publications/ifsar/lafinal08_01/five/5.1.1_frame.htm. Retrieved 2007-12-29. ^ Medina, M.A. ; J.C. Reid, and R.H. Carpenter (2004). "Physiography of North Carolina". North Carolina Geological Survey, Division of Land Resources. http://www.geology.enr.state.nc.us/proj_earth/pdf/color_physiography_600dpi.pdf. Retrieved 2007-12-29. ^ Tollo, Richard P. (2004). "Northeastern Section (39th Annual) and Southeastern Section (53rd Annual) Joint Meeting". ^ "History of Rappahannock County". Rappahannock County Administration. 2005. http://www.eoffice.com/offices/_540/675/5330/my_webserver/files/newsite/page2/page2.html. Retrieved 2007-12-29. ^ a b Blue Ridge Mountains. From The New Georgia Encyclopedia]. Accessed February 2010. ^ "Stonewall Jackson's Way". Poetry and Music of the War Between the States. http://www.civilwarpoetry.org/confederate/songs/tjway-song.html. Retrieved 2007-12-29. Olson, Ted (1998). Blue Ridge Folklife, University Press of Mississippi. ISBN 1-57806-023-0. This page uses content from the English language Wikipedia. The original content was at Blue Ridge Mountains. The list of authors can be seen in the page history. As with this Familypedia wiki, the content of Wikipedia is available under the Creative Commons License.